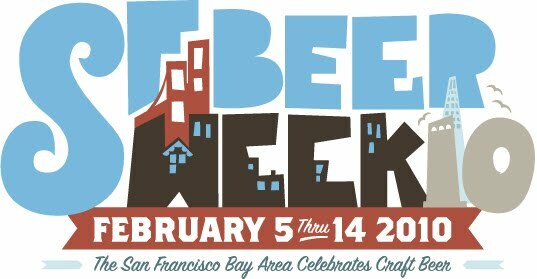 They call it San Francisco Beer Week, but we do drink craft beer down here in the South Bay. So Linda and I really appreciated last Wednesday night’s Beer and Cheese pairing at Firehouse Grill and Brewery in Sunnyvale held as part of San Francisco Beer Week. Firehouse Brewing, Milk Pail and South Bay Craft Beer Activist and Blogger Peter Estaniel got together to bring this all together. The format was pretty simple. 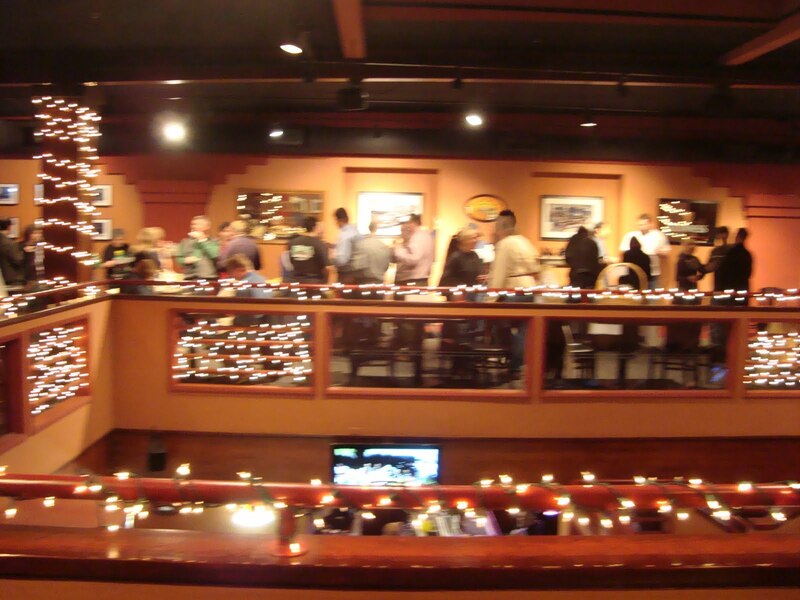 Upstairs at the brewpub, six tables were set up with 2-3 different cheeses and beers placed at each table. You simply pick up a flute glass, and start walking around, and popping cheeses into your mouth and washing them down with the different beers, chatting with everyone there, until you get tired of doing that. Needless to say, it took most people the entire evening to complete this mission. There was an interesting and varied mix of beers to try, with plenty of Belgian Ales, whether stately, sour, or funky, four or five selections from FireHouse, a couple of hop monsters, and a barley wine thrown in for good measure. But the real star of the evening was the cheese. And did they have cheese. Cheese with funny looking fern-thingies on top. Stinky cheese. Runny cheese. Firm cheese. Crumbly cheese. Cheese infused with truffles. Cheese with spices mixed in. Cheese studded with wine grapes. Cheese with barnyard hay on top. I couldn’t correctly pronounce the names of most of the cheeses, but that didn’t stop me from trying them all. It’s a good thing I have a few fat-burning long distance runs in my training schedule over the next few days. My favorite cheese, hands down, was the smooth, slightly sweet, and caramelly Gjetost (pronounced: yay-toast). I could have this for breakfast, lunch, dinner and dessert. I also enjoyed the Horseradish Havarti which had crunchy mustard seeds mixed into it. I could talk about all the cheeses, but really don’t know all that much about cheese, let alone a good way to describe how they taste. And while ignorance hardly stops most people from writing on a topic, if you really want to know what some of the cheeses were like, head on over to this post at Peter’s blog. As for the beer, my favorites were a couple of the Firehouse brews. I had previously enjoyed their rich and refined One Tun Imperial Stout, which has a great bitter chocolate vibe, but it seemed especially good that evening. And I also appreciated the Bill Brand Imperial Red, where lots of hefty, toasty malt holds its own against hefty amounts of hops, resulting in a lively, strong yet balanced Imperial Red. As for Linda, her favorites were the Belgian Ales, which evoked carefree weeks of self-discovery spent many years ago in Belgium. I leave you with this lasting haunting and surrealistic image of that memorable evening. There are people, who do not share my artistic vision, that will simplistically claim this shot is blurry and badly out of focus. 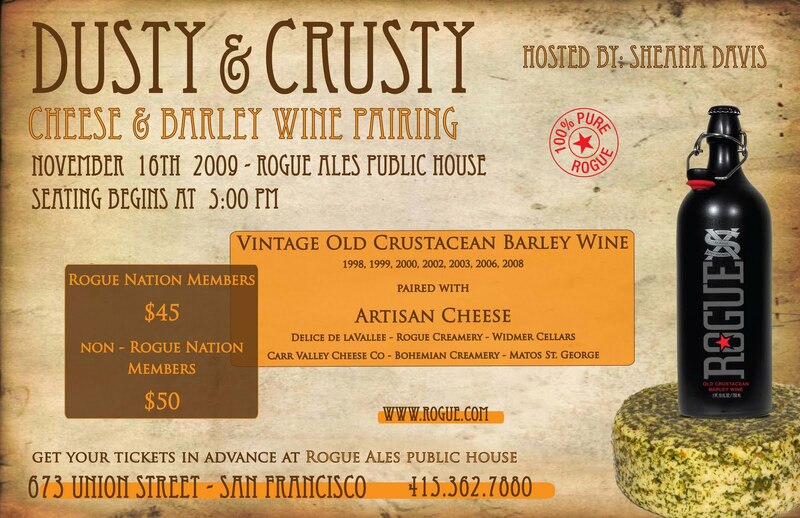 A few days ago, Ross Baechle, who’s involved in “Marketing / Athlete Services” e-mailed me to spread the word about Dusty & Crusty, a Cheese and Barley Wine Pairing being held at Rogue Ale house November 16. I’m afraid he didn’t respond to my question about how “Athlete Services” fits into Rogue’s plans, so this may forever remain a mystery. But you can never go wrong with beer and cheese, and the event looks pretty yummy. Hosted by Sheana Davis of the Epicurean Connection, 7 years of Rogue Old Crustacean Barleywine will be paired with artisan cheeses from Delice de la Vallee, Rogue Creamery, Widmer Cellars, Carr Valley Cheese Company, Bohemian Creamery and Mato St. George. Wanted to pass along I message received from Jesse Friedman over at Beer & Nosh about the upcoming NOToberfest event he’s hosting this October 10. From the looks of things so far, looks pretty unique, interesting and of course, delicious. Here’s what’s in the works. – Reinheitsgebot-breaking beers from Valley Brewing Co.
$50 prepurchase / $60 at the door – All inclusive for beer, food and commemorative tasting glass.